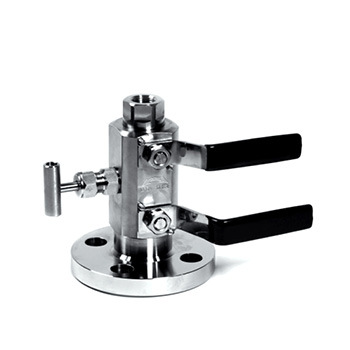 TECVAL DBB-03 process interface valves enables you to reduce drastically space and weight in the process of installations. It reduces the possibility of leaks and the maintenance. Their distribution diagram consist of two ball valves to block the line and one needle valve to bleed in 90º outflow. Process interface in one compact ball/needle/ball valve assembly. Pressure ratings in accordance with ASME B16.5. Flange port compatible with ASME B16.5 RF. Instrument port 1/2"NPT Female (ASME B1.20.1.). Vent port 1/2"NPT Female (ASME B1.20.1.). No ejectable ball and needle stem design. Instrument & Vent port 1/4"NPT Female. O-ring seals in several materials. Flanged ports compatible with ASME B16.5 RF. Flanged ports compatible with ASME B16.5 RTJ. 1/2" 3/4" 1" 11/2" 2"
20 Packing P.T.F.E. P.T.F.E. P.T.F.E.